The Cassell family stands in front of the newly named Cassell Hall. 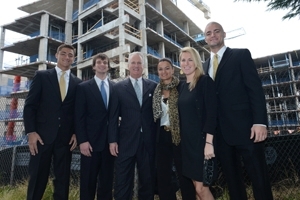 Left to right: Dolan Bradley, Robert Cassell, Jack Cassell, Denise Cassell, Jacqueline Cassell, Devon Bradley. Photo by Jeff Watts. Jack Cassell’s AU roots run deep. They began growing when he was just a little boy. Cassell, SOC/BA ’77, a current trustee and longtime supporter of the university, recalls his first memory of this place. He was about four years old and his father, Stafford H. “Pop” Cassell, CAS/BA ’36, who was an AU student, coach, athletic director, and vice president, looked for permanent housing, the university rented them an apartment on campus. It was the first time the younger Cassell remembers feeling like a part of the AU community. When his father died six years later, Cassell felt AU’s spirit even more acutely. Pop’s colleagues looked out for Cassell’s widowed mother, Carolyn, and the rest of the family. Cassell always remembered that AU generosity. “That catapulted me to want to give back,” Cassell said. On Monday, AU announced its newest residence hall will be named Cassell Hall in honor of the Cassell family. The naming recognizes $3 million in gifts made by Cassell, his wife, Denise, and the Cassell family to support the residence hall’s construction and AU’s Department of Athletics and Recreation. This is the first AU residence hall to be named for a philanthropic gift, and the first to be built on campus since Centennial Hall opened in 1987. The building, currently in construction behind the President’s Office Building, will reach eight stories and will accommodate beds for 360 upperclassmen in suite-style rooms. Cassell Hall will feature an 8,000-square-foot fitness facility, to be named the Stafford H. Cassell Jr. Fitness Center in honor of Cassell’s twin brother and fellow AU alumnus. This new facility will double the amount of fitness space on the main campus. In keeping with AU’s commitment to sustainability, Cassell Hall is designed to achieve Leadership in Energy and Environmental Design (LEED)Gold certification. The School of International Service building also earned that designation in 2011. When Cassell and his twin brother were boys, they had the run of AU’s campus. They hit baseballs and kicked soccer balls on the school’s athletic fields and explored every hidden corner of the university’s grounds. In the 1960s when AU had a baseball team, Cassell and his brother served as batboys. They had their own personalized uniforms with the numbers 0 and 00. Cassell thinks he might have been 00 because he was the younger of the boys by two minutes. Cassell and his family were always welcome on campus. The players and coaches of the university’s athletic teams helped shepherd the boys through their teen years. “The players and coaches provided a great mentoring experience for us,” Cassell added. When it came time to pick a college, Cassell followed in his father’s footsteps. At AU, Cassell served as the starting goalie on the varsity soccer team, tying the record for the least number of goals allowed in a single season. He was also the president of his fraternity, Phi Sigma Kappa, and the recipient of the Stafford H. Cassell Student Achievement Award that is named for his father. One of Cassell’s proudest moments came when he earned a letter jacket for his soccer achievements. “It was so special to me because it reminded me of my dad. He always wore his AU letter jacket around campus on the weekends,” he said. After graduating with a degree in communications, Cassell needed a job. He sought the advice of his mentor and former Dean of Students Edward Boehm, who encouraged him to apply for a rental technician position at Visual Aids Electronics (VAE). The company provides audiovisual equipment for high-profile meetings and events. Cassell advanced rapidly, learning every position at the Washington, D.C. -based company over an eight-year period. Ten years after joining VAE, Cassell had become its president. Shortly thereafter, he bought the company. He attributes his meteoric rise to his communication skills and the fact that he always delivered on his commitments. Cassell credits his role as fraternity president and participation in NCAA Division I athletics with instilling in him a sense of leadership and an understanding of human relations. Those skills served Cassell well — when he started with VAE, the company had 25 employees and three offices. Today, under Cassell’s stewardship, VAE boasts more than 900 employees in 80 offices across the country. Over the years, Cassell has been the recipient of the AU President’s Award in 2009 as well as the Alumni Achievement Award in 2004. He served as the chair of the AU Athletics Committee for six years. He is also a devoted trustee — he has never missed a meeting during his nearly 10-year tenure. Cassell is also an AU parent. His daughter, Jacqueline Cassell, and his stepson, Devon Bradley, are current AU undergrads. Bradley is a member of the varsity wrestling team. Cassell and wife, Denise, have two other children — sons, Robert Cassell and Dolan Bradley. One of Cassell’s happiest moments as a parent came when his daughter received the big blue envelope from AU containing her acceptance letter. He recalls being “overwhelmed with emotion” to know that his daughter would be carrying on the family’s AU legacy. Cassell is proud to be part of the legacy. He thinks his father would also be proud of all that his son has been able to achieve. He’d also be heartened by AU’s growth and maturation as an institution, Cassell said. “I’m sure my father would be floored at how far the university has come over the years. It’s a gorgeous campus now,” Cassell said. Cassell’s outlook for AU is bright. Under President Neil Kerwin’s leadership, Cassell sees a stable future built on a responsible and forward-thinking financial strategy and transformational campus plan. He says he hopes his family’s contribution is just the beginning of greater alumni investment. Cassell explained that none of his contributions to AU would have happened were it not for his father’s passion for AU.